I was going to post Part II of “Different Kinds of Jews,” but it felt pretty ironic to be posting specifically about our differences and bitterest conflicts on the eve of the first annual Unity Day. The day was established in memory of Eyal Yifrach, Gil-ad Sha’ar and Naftali Frankel, who were kidnapped and murdered by Palestinian terrorists on the 16th of Sivan (tonight/tomorrow’s Hebrew date) one year ago. You and I were in touch around this time last year, and I included you on my e-mail update list, so you know about the events of last summer and how they affected me. Nonetheless, I want to write a little bit about it from the perspective of a year later. 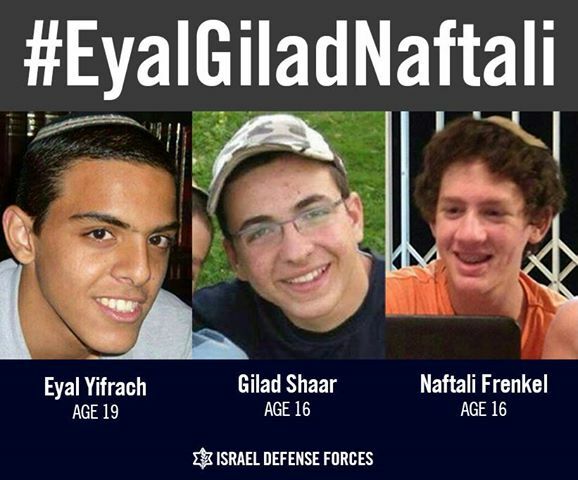 Eyal, Gil-ad and Naftali were three teenagers who studied in the Hebron area and lived in central Israel. They were waiting at a bus stop around a 25-minute drive from here. A car stopped for them, driven by two Palestinians, terrorists affiliated with Hamas. At this point I should explain that hitchhiking is extremely common and generally considered safe in this area, as a result of the strong sense of community and the abysmal public transportation. We now know that the teens were shot and murdered by the terrorists, and then hastily buried in a field north of Hebron. But at the time all we knew was that they were missing, and the search for them led to a wide-scale operation in Hebron and the area, leading to clashes, Palestinian casualties, and heightened tensions. The bodies of the teens were found on June 30th, 2014. A picture of the teens posted to the social media by the IDF. In those 18 days, the entire country held its breath. We obsessively checked the news. Countless prayer groups were formed. I took my son to a Psalm-reading session that was organized for children. There was a very, very strong sense of unity and solidarity. 30,000 Jews gathered to pray at the Western Wall for the safe return of the teens. 75,000 people from all walks of life came to a solidarity rally and concert at Rabin Square. And when the teens’ bodies were found, the entire country fell into deep mourning. Vigils were held all over the country, lighting candles, singing sad songs. Not only in Israel, either. This one was in Washington DC. Walking outside that day, it felt like Tisha B’Av, the day we mourn the destruction of the Temple (post forthcoming). You could see the sadness in every eye in the street, feel the intense despair in the air. I saw my neighbor in the stairwell that day and didn’t say a word, just touched her shoulder. This came through during the war, too. 90% of Israeli Jews supported the operation in Gaza. Getting 90% of Israeli Jews to agree on ANYTHING is nothing short of a miracle. And there were miracles. If not for the kidnapping and subsequent escalation, Hamas would have been able to carry out a massive surprise terror attack through that network of tunnels, which they had planned to do very shortly after the teens were kidnapped. I recently saw a video of an interview with an IDF commander who told how a catastrophic attack from the terror tunnels was thwarted by the actions of some oblivious Jews from Bnei Brak who had that field cleared because of a number of halakhic strictures. An acquaintance of mine from high school told the following story: she was driving on Highway 431 between Rehovot and Tel Aviv when the siren sounded. She didn’t know what to do, but she saw other drivers pulling over so she followed suit, got out of the car and got down. She has always been afraid of loud noises, and she heard huge explosions overhead and felt so vulnerable. Finally when it was over she walked back to her car and found herself starting to have an anxiety attack–crying hysterically and shaking like a leaf. A man who had pulled over beside her noticed her and walked over to ask if she was okay. She said “no”. The man just stood there with her, soothing her and telling her it would soon pass, and did not leave her side until she had calmed down and was ready to continue her drive. Other stories and pictures have been circulating of perfect strangers rushing over to children taking cover on the street and protecting them with their bodies. A million videos of the soldiers dancing and singing on the border–not to celebrate death, the way the terrorists do, but to celebrate life, singing “Am Yisrael Chai” and “the Eternal Nation does not fear a long journey”. Solidarity with the south. Tons of goodies and volunteers streaming into the rocket-stricken cities and running activities for the kids. And all kinds of activities and “fun days” arranged for them in safer areas. There has been a constant, constant flow of pizza, goodies, essentials, and letters from citizens to the soldiers. I don’t think I remember seeing anything of this scale in the previous wars I’ve been here for. There is a picture circulating of a tank decorated with children’s drawings and letters sent to the soldiers. Unlike Hamas, they guard themselves not with our children’s lives, but with their love. People making aliyah (immigrating to Israel). A few hundred French Jews arrived recently, saying that they feel safer in the bomb shelters in Israel than walking down the streets of Paris with a kippah on. (By the way, if you think the horrible anti-Semitic demonstrations are limited to Europe, think again; anti-Semitic activity has spiked around the world, including the United States, Canada, and New Zealand.) Someone I know just made aliyah with her family through Nefesh B’Nefesh; not a single person canceled or postponed plans because of the situation. It is very difficult to convey what we went through last summer. Just today we had a national security drill with the air raid siren, and even though I was expecting it and knew it was a drill, that rising and falling wail never fails to make my heart pound and my skin crawl. During and after the war, we all joked with each other about “Phantom Siren Syndrome”–jumping out of our skin at any sound that resembled the beginning of the siren, like an ambulance or a motorcycle accelerating. Still, it was not my first experience with a grim security situation (the height of the Second Intifada in 2002 was MUCH worse), nor with ducking for cover at the wail of an air raid siren (Second Lebanon War, 2006, a few months before we met); nor with doing that as a mother (Operation Pillar of Defense, 2012). The thing that was extraordinary about this war was the incredible level of unity. And that is why Unity Day and the Unity Prize that were established in memory of the teens feels so appropriate. If there is one thing I hope I never forget, it’s that feeling of love from Jews all over the country and Israel supporters all over the world, that sense of oneness. Thank you, Eyal, Gilad, and Naftali, for showing us what we are capable of.